Me: Where is the pain? Mr.S: It’s my upper right back tooth. Me: How long has it been bothering you? Mr. S: For about a week. Me: What are your symptoms? Mr. S: It hurts quite a bit when I bite down. 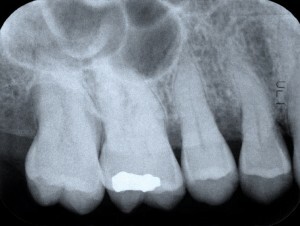 No decay – no sign of any infection involving the gums – the existing fillings look good – gums are generally in good condition i.e., pink, tight and generally healthy – x ray is normal; over all; everything looks normal. Me: Do you have any other symptoms? i.e., any sensitivity to hot or cold stimuli? Or is it just when you bite down? Mr. S: Only when I bite down and only on my right side. Me: Have you had a cold lately? Any sinus problems? Mr. S: Yes, a head cold and it feels as if my sinuses are stuffed up. Mr. Smith, it looks like you have a sinus infection. The reason you are having pain is that the roots of your molar teeth protrude into the sinus (you can see this in the accompanying image). Because your sinuses are congested and the roots of your molar teeth go in to the sinus (see *below) when you bite down, this puts pressure on the teeth and this is the discomfort that you feel. The roots of the teeth are embedded in the bone and there are special fibers which surround the roots called Periodontal Ligament Fibers or PDL fibers. These fibers have sensory receptors in them, which mean they can ‘react’ to stimuli. When you bite down, these fibers become compressed due to the congested sinuses and this is the pain and discomfort that you end up feeling. It’s a little bit hard to understand this concept, but for our purposes, all you need to know is that if the sinuses are congested and the roots protrude in to them…this can feel like tooth pain. *In the next entry, I’ll be explaining what the sinuses are and how they relate to dental matters. See your family doctor or an E.N.T. specialist who will confirm the diagnosis and place you on an appropriate antibiotic which will address the sinus congestion. If after taking the antibiotic, you still have pain, make a follow up appointment with your local dentist to further investigate the problem. If you are experiencing tooth pain and recognize any of the symptoms mentioned above, please do not hesitate to contact us at 905-791-3867 or email us at robertaxelrad@rogers.com. 11 Responses to Roots in the sinus…what does this mean?